Andrew Burns first married Margaret Blackwood daughter of William Blackwood and Mary Barber on 7 Nov 1797 in Ayr. Christened on 20 Apr 1801 in Fort George. William Burns was born on 17 Jan 1829 in Ayr, Ayrshire. He was christened on 1 Feb 1829 in Ayr, Ayrshire. Recorded in the family household with his mother for the 1841 census. For the census of 1851 what is believed to be William was recorded lodging in the house of Alison Walker at 24 Bridge Street, Ayr. He was identified as a Clerk in the Union Bank of Scotland, aged 22, and born in Ayr, Ayrshire. William Burns married Sarah H. Bell on 19 January 1856, Govan, Lanarkshire. William was identified as aged 27, a Clerk, resident at 64 Abotsford Place, Glasgow, the son of William Burns, a merchant, and Mary Wilson. Sarah was identified as aged 27, resident at 37 North Hanover Street, Glasgow, the daughter of William Bell, a Merchant, and Elizabeth Cummings. The witnesses were Alexander Weir and William Mathieson. William Burns born 29 September 1857, Anderston, Glasgow, Lanarkshire. Sadly Sarah Burns, nee Bell, died aged 29 in 1857, in Anderston, Glasgow, Lanarkshire. In this record her middle name was identified as Harridge i.e. Sarah Harridge Burns. William Burns remarried 3 years later to Jane Sclanders on 20 March 1860, Blythswood, Glasgow, Lanarkshire. William was identified as aged 31, a widower employed as a Clerk, resident at 1 Clutha Street, Paisley Road, Glasgow, the son of William Burns, a Clothier, and Mary Wilson. Jane was identified as aged 23, resident at 8 St Georges Road, Glasgow, the daughter of Alexander Sclanders, a Grain Merchant, and Elizabeth Alexander. The witnesses were James Cowan and David Sclanders. Jane was born 14 October 1836, Barony, Lanarkshire. Elizabeth Alexander Burns was born 7 May 1861, Govan, Lanarkshire. Mary Louisa Wilson Burns was born 27 November 1862, Govan, Lanarkshire. Alexander Sclanders Burns was born 22 August 1864, Milton, Lanarkshire. Andrew Burns was born 1 March 1867, Milton, Glasgow. Alice Jane Burns was born 17 December 1868, Govan, Lanarkshire. Arthur Burns was born 6 April 1871, Govan, Lanarkshire. Bertha Sclanders Burns was born 26 November 1872, Govan, Lanarkshire. Frederick William Burns was born 1 October 1874, Govan, Lanarkshire. Hilda Burns birth was registered in 1878 in Tradeston, Glasgow. Ethel Burns birth was registered in 1880 in Tradeston, Glasgow. Click here for further details of all William's known children. For the census of 1861 what is assumed to be William, was staying in the Inn of James McLauchlan at Portansherry, Ardchonnell, by Loch Awe. He was recorded as William Burns, a visitor, married aged 32, a Merchant, born in Ayr, Ayrshire. His wife Jane was recorded living at 1 Clutha Street, Govan. She was recorded as a wife, aged 24, born in Glasgow, Lanarkshire and included in her household was William H. Burns, identified as son, aged 3, born in Glasgow, Margaret Burns, a visitor, aged 31, born in Ayrshire, and Mary Donn, aged 19, a servant, also born in Ayr, Ayrshire. William H. Burns was Jane's step-son, being the son of her husbands first wile, Sarah (see above), and I would assume that Margaret Burns was in fact her husband's Aunt, the daughter of Andrew Burns and his second wife Janet Bell, born 29 Apr 1829 in Ayr. The fact that William was away from home and Jane was within a few weeks of producing their first child, a daughter Elizabeth, (born 7 May 1861), may be the reason for Margaret Burns being in the household. For the census of 1871 William and Jane were resident at 9 Victoria Crescent, Govan, Partick, Glasgow. William was recorded as aged 42, an Iron Broker, born in Ayr, Ayrshire, and Jane was recorded as aged 34, born in Glasgow, Lanarkshire. Included in the household were their three children, Mary L(ouisa) W(ilson), aged 8, a Scholar, Alexander S(clanders), aged 6, a Scholar, and Alice Jane aged 2, all identified as born in Glasgow, Lanarkshire, along with two servants, Mary Donn aged 29, simply identified as a servant in the previous census but now described as a nurse, born in Glasgow, Lanarkshire and Joanna McLennan aged 27, employed as a general servant, born in Ross & Cromarty. There were two children missing from this census Elizabeth Alexander Burns born 1861, who had died aged 2 in 1863, and Andrew Burns born 1867, who had died also aged 2 in 1868. Mary Donn's promotion to "nurse" may well be due to the imminent birth of William and Jane's next child, Arthur who was to arrive on 6 April, 3 days after this census was taken! William Burns died on 20 Dec 1879 in 16 Knowe Terrace, Pollokshields, Glasgow, Lanarkshire. He was recorded as firstly married to Sarah Bell and secondly to Jane Sclanders, an Iron Broker, aged 50, with his parents being William Burns, a Master Tailor, and Mary Burns, maiden name Wilson, both identified as deceased. The informant was his son Alexander Burns, who was present. For the 1881 census the widowed Jane Burns was recorded, aged 44, resident at Bilmar Terrace, 70 Shields Rd, Pollokshields, Glasgow. Also included in the household were all her children - Mary aged 18, Alexander aged 15 employed as a clerk, Alice aged 12, Arthur aged 10, Bertha aged 8, Frederick aged 6, Ethel aged 3 and Hilda aged 1. Arthur, Bertha and Frederick were recorded as scholars. Sadly Hilda aged 1 was actually born after the demise of William, her father. There was also a general servant recorded in the household, a Kate M. Stewart aged 20, born in Auchterarder, Perth. For the 1891 census Jane was resident at Windsor Terrace, Cathcart, Renfrewshire, identified as head of the household, a widow and aged 54. Once again all her children were recorded in the household - Mary L(ouisa) W(ilson) aged 28 employed as a Milliner, Alexander aged 25 employed as a clerk, Alice J(ane) aged 22 employed as an assistant librarian, Arthur aged 19 a clerk, Bertha aged 18, Frederick W(illiam) aged 16, Ethel aged 13 and Hilda aged 11. The three younger children were still at school and with the exception of Hilda and Ethel who were identified as born in Glasgow, Renfrewshire (i.e. Cathcart), the rest of the family were recorded as born in Glasgow, Lanarkshire. For the census of 1901 Jane was recorded as resident at 17 James Gray Street, Cathcart, Renfrewshire, identified as head of the household, a widow and aged 64. Other than Alexander who had married and was living with his in laws, the rest of her children were again recorded in her household - Louis aged 38 employed as a Milliner, Alice J(ane) aged 32 employed as an assistant librarian, Arthur aged 29 employed as an engineer's clerk, Bertha S(clanders) aged 28 with no occupation listed, Fred W(illiam) aged 26 employed as a warehouseman in a pattern room, Ethel aged 23 employed as a dressmaker, and Hilda aged 21 employed as a music teacher. All of the family were recorded as born in Glasgow, Lanarkshire. For the census of 1911 Jane was once again recorded as resident at 17 James Gray Street, Cathcart, Renfrewshire, identified as head of the household, a widow and aged 74, living on "private means". Frederick William, like his brother Alexander in the previous census, had married and flown the nest. However Jane still had 6 of her children recorded with her household - Louis aged 48 working as a Milliner but as an "employer", A(lice) J(ane) aged 42 employed as an librarian in the public library, Arthur aged 39 employed as an iron and steel merchant, Bertha S(clanders) aged 38 with no occupation listed, Ethel aged 33 with no occupation listed, and Hilda aged 31 employed as a music teacher. The family were all recorded as born in Glasgow, Lanarkshire. For the 1841 census the widowed Mary was recorded living at New Market St., Ayr, aged 35, born in England, and working as a Baby Linen maker. Included in the household were her sons, Andrew aged 14 and William aged 12, along with a Mary Wilson aged 9, an Andrew Cowan aged 12, and a female servant Janet Parker aged 16, all of whom were identified as born in Ayrshire. One would assume that Mary Wilson aged 9, and Andrew Cowan aged 12 were relatives of Mary and \ or her husband William. Just over 7 years after this census, on 15 July 1848, Mary Burns, nee Wilson, passed away. There is a record of her death and her interment 3 days later on the 18 July 1848 in Ayr. She was identified as Mary Burns or Wilson of High Street, aged 49 with the cause of death listed as "Fever". Andrew Cowan born 22 March 1829, Ayrshire. Andrew Cowan married Jane Templeton Ferguson on 3 December 1863, Ayr, Ayrshire. Andrew Burns Cowan died on 6 November 1907 in Viewfield, Troon, Ayrshire. Jean Templeton Cowan nee Ferguson died aged 84 on 11 January 1924 at Drumsuy, Troon, Ayrshire. Margaret Cowan born 29 May 1831, Ayrshire. It is believed Margaret may have died in infancy as she was not included with either her mother or father in the 1841 census . John Cowan born 13 April 1833, Troon, Ayrshire. John married Margaret Andrew Adam, daughter of Matthew Adam and Mary Ferrie on 6 July 1859 in Ayr, Ayrshire. (For further details of the parents and siblings of Margaret Andrew Adam - click here). John Cowan died 20 January 1892 at 7 Ashton Place, Hillhead, Glasgow. Margaret Cowan, nee Adam, died on 30 May 1902 also at 7 Ashton Place, Hillhead, Glasgow. James Cowan born 12 April 1835, Troon, Ayrshire. James married Marion Jane Coulthard on 18 September 1866, Central District, Glasgow, Lanarkshire. James Cowan died aged 62 on 13 February 1897 at Fairlight Villa, Maitland Place, Cathcart, Glasgow. Marion Jane Cowan nee Coulthard died aged 79 on 31 March 1922 at 192 Hyndland Road, Partick, Glasgow. Jane Cowan born on 19 April 1837, Dundonald, Ayrshire. Jane married James White 27 April 1871, Dundonald, Ayrshire. James White, died on 19 February 1908, at Vancouver, Victoria Drive, Troon, Ayrshire. Jane White, nee Cowan, died aged 89 in 14 January 1927 at 115 Templehill, Troon, Ayrshire. Janet B(ell)? B(urns?) Cowan born 12 May 1839, Dundonald, Ayrshire. Janet Cowan died, unmarried, aged 93 on 3 January 1933 at 115 Templehill, Troon, Ayrshire. William Burns Cowan born on 13 Sep 1841 in Troon, Ayrshire. >William, an Iron Salesman, was firstly married to Elizabeth Wilhelmina Martin on 26 Dec 1871 in Presb. Church of St John Sligo Ireland. Sadly Elizabeth Wilhelmina Cowan, nee Martin, died in 1875 in Kelvin, Glasgow, Lanarkshire. William secondly married Lilias Douglas Coverly in 1876 in Kinning Park, Glasgow, Lanarkshire. Sadly Lililias Douglas Cowan, nee Coverly, died in 1889 in Kinning Park, Glasgow, Lanarkshire. William latterly married Jane Campbell Cameron in 1906 in Blythswood, Glasgow, Lanarkshire. Jane Campbell Cowan, nee Cameron, died on 23 Nov 1922 at 44 Queens Square, Strathbungo, Glasgow, Lanarkshire. William Burns Cowan died on 17 Jul 1926 also at 44 Queens Square, Strathbungo, Glasgow, Lanarkshire. Click here for further details of all John and Janet's known children. For the census of 1841 John and the three older children were recorded at Templehill, Troon, with John recorded as a "Post Master"
1841 Census (7th June) Dundonald (590) Folio 5 Book 5 Page 16. His wife Janet, who would have been about six months pregnant with their son William Burns Cowan, was resident in the household of John's parents Andrew and Jane, at their farm, West Drumsuy, Coylton. 1841 Census (7th June) Coylton (583) Folio 0 Book 2 Page 2. John Morrison Cowan died, aged 77, on 15 Apr 1878 in Templehill, Troon. He was recorded as a House Proprietor, married to Janet Burns, and the son of Andrew Cowan, a Farmer, and Margaret Cowan, maiden name Walker. The informant was A. B. Cowan, son, present. For the census of 1881 the widowed Jane,t aged 77 and recorded as an "Annuitant" was again recorded at Templehill, Troon. Included in the household were her unmarried daughter Jessie (Bell Burns) Cowan aged 40, and her married daughter Jane White, and Jane's two children, her grandchildren, James aged 7 and George aged 3. The whereabouts of James White Jane's husband is unknown and it is possible that he had passed way, although Jane would seem to have been identified as "Married" rather than "Widowed". Janet Cowan, nee Burns, died, aged 78, on 6 Sep 1881 in Templehill, Troon. She was recorded as the widow of John Morrison Cowan, a House Proprietor, and the daughter of Andrew Burns, a Clothier, and Margaret Burns maiden name Blackwood, both identified as deceased. The informant was A. B. Cowan, son, not present. John Cowan's brother married a Margaret Gilmore and their daughter Jane married a John Glen Elliot, grandson of Alexander Glen and Margaret Paul, through their daughter Helen and her husband William Elliot. Therefore this marriage links (through marriage) the Burns & Glen families who were latterly linked again with the marriage of my grandparents Robina Adam (Burns) and John W. Hendry, (Glen) in 1917. (For the details of this connection - click here). Margaret Stewart was christened on 3 Dec 1833 in Ayr. Thomas Stewart was christened on 19 Mar 1835. Thomas married Mary Ann Donald daughter of Andrew Donald and Isabella Allison on 19 Nov 1863 in Tradeston, Glasgow. Andrew Stewart was christened on 28 Apr 1839 in Largs. Marion Stewart was christened on 23 Jul 1843 in Largs. Marion Reid Stewart was christened on 5 Sep 1847 in Largs. William Stewart was born about 1849 in Largs ?. William married Katherine Miller ? Susanna Stewart was born on 28 Dec 1851 in Barony, Glasgow. Jane Amelia Stewart was born about 1855 in Glasgow ?. Mary Ann Stewart was born on 25 Apr 1859 in Tradeston, Glasgow. 1841 Census (7th June) Largs (602) Folio 4 Book 5 Page 23. John Stewart was still in Largs for the 1851 census at Jades Land? (difficult to read) but must have moved to Glasgow very shortly afterwards as he is listed in the 1851 Glasgow Directory as living at 48 Bedford Street, and the 1852 Glasgow Directory as living at 116 Waterloo Street. Also the birth of his daughter Susanna on 28 December 1851 was recorded in Barony, Glasgow. At the time of the 1861 census John was living at 80 South Portland Street. Business seems to be good but this is not surprising as the amount of building going on in the city of Glasgow from the mid nineteenth century to the beginning to the twentieth must have been considerable. His son Thomas and business partner is living close by in Norfolk Street. John Stewart - 10 March - Confirmation of John Stewart, Slater, 13 Wallace Street, Glasgow, residing at 80 South Portland Street there, who died 6 January 1876 at Glasgow, intestate, granted at Glasgow to Thomas Stewart, Slater, 13 Wallace Street, aforesaid, Executor dative qua next of kin. Value of Estate £896, 6s, 4d.. Additional Inventory given up 28 June 1881. Margaret Burns born on 29 Apr 1829 in Ayr. Elizabeth Bell Burns born on 15 Jun 1834 in Ayr. Sarah Hunter Burns born on 19 Aug 1840 in Ayr. Margaret Burns was recorded with her father and her mother at High Street, Ayr, for the 1841 census. She died unmarried on 30 January 1900 at 33 Sandgate Street, Ayr. Cause of death was breast cancer and the informant was William Paton, friend, 9 Mitten Road, Ayr. Recorded in the household of her married sister Sarah for the 1881 census. (See following). Elizabeth Bell Burns died unmarried at 5 Montgommerie Terrace, Ayr, on 20 November 1907. Commemorated on the 2nd family headstone the Auld Kirk graveyard in Ayr as “died on 15 Sep 1841”. (For an image and a transcription of the headstone - click here.) Not found with family for the 1841 census. Is the month in this date inaccurate or misread? Robert Scott was born on 15 Aug 1913 in Alberta, Canada. Robert married Jantina Magrita ?????? was born 30 Apr 1923. Robert and Jantina had three known children. Robert died on 31 January 1993, in Tofield, Lloydminster Census Division, Alberta, and was interred in Tofield cemetery. Jantina Magrita Scott died on 5 November 2007, in Tofield, Lloydminster Census Division, Alberta, and was interred in Tofield cemetery. Alexander (Sandy) Scott was born on 26 August 1915 in Alberta, Canada. Alex married Irene ?????? born 12 August 1922. Alexander and Irene had three known children. Alex died on 6 December 2003, in Tofield, Lloydminster Census Division, Alberta, and was interred in Tofield cemetery. For the census of 1916 the family were recorded at Ubraina, near Brown Lake, Alberta. Andrew was recorded as a Farmer, aged 47, along with Jessie aged 39, both identified as born in Scotland. Included in the household are their two sons, Robert aged 2 and Alexander aged 9 months, both identified as born in Canada. Jessie was recorded as having arrived in Canada in 1912 but Andrew having arrived in 1905. One wonders if the couple were an item before Andrew's initial trip to Canada, or whether he had returned and taken up with Jessie thereafter. For the census of 1921 the family were recorded resident in Cornhill, Victoria, Alberta. Andrew was recorded once again as a Farmer, aged 58 and Jessie was recorded as aged 42, with both identified as born in Scotland. Also included in the household were their two sons, Robert aged 7 a scholar, and Alexander aged 2, both identified as born in Alberta. Andrew was again recorded as having come to Canada in 1905, but Jessie was recorded on this occasion as having arrived in 1911. The couple died in Tofield, Lloydminster, Alberta, Canada and there is a record of their graves in the Tofield cemetery included in the Findagrave website - Andrew C. Scott 1868-1948 and Jessie B. W. Scott 1877-1958. Alexander John Fergusson whose birth was recorded in 1879 in Ayr, Ayrshire. Alexander carried on the family printing business at 18-20 High Street, (east side), Ayr. Ayrshire. Alexander married Jessie Williamina Mitchell in 1910 in Ayr, and for the census of 1911 himself and Jessie were recorded resident at 14 Aisla Place, Ayr. Alexander was recorded as Alexander J. Fergusson, aged 31, a printer and stationer, born in Ayr, Ayrshire, and Jessie was recorded as Jessie W. Fergusson, aged 35, born in Ardnamurchan, Argyllshire. The couple were recorded as married for under 1 year and having had no children. Jessie was Jessie Wilhelmina Mitchell, born 21 June 1874, in Acharachle, Ardnamurchan, Argyllshire, the daughter of William Mitchell, a salmon fisher and tacksman, and Jessie Cuthbert Ballantine. Jessie died at Ballochmyle Hospital, on 22 August 1964, although the family home was 2 Bellvale Quadrant, Ayr, Ayrshire. Alexander died on 18 September 1969 at Heathfield Hospital, Ayr,Ayrshire. It is unknown whether the couple had any children. William Hunter Fergusson whose birth was recorded as born in 1884 in Ayr, Ayrshire. William married Elizabeth Drinnan on 5 September 1912, at the Station Hotel, Ayr. William died on 6 July 1962, at Ballochmyle Hospital, Mauchline, although his usual address was 11 Bellevale Avenue, Ayr. He was recorded on the death certificate as William Hunter Nicholson Burns a retired cashier, aged 78, married to Elizabeth Drinnan, the son of Alexander Ferguson, a Master Printer, and Sarah Hunter Burns, both identified as deceased. The informant was Alex. J. Fergusson, brother, of 2 Bellevale Quadrant, Ayr. Elizabeth died 25 October 1966 at Holmhead Hospital, Old Cumnock, although her usual residence was give as 25 Ewenfield Avenue, Ayr. She was recorded on the death certificate as Elizabeth Ramsay Fergusson, born 28 July 1883, married to William Hunter Nicholson Fergusson a cashier in a Fertiliser Manufacturer, and the daughter of James Hill Drinnan, a master plumber, and Helen Jamieson Drinnan, maiden name McClelland, both listed as deceased. The informant was George Carson, brother in law. (m. Marion Gillespie Drinnan in 1926 in Ayr). As the informant of the death of William was his brother, and the informant of the death of Elizabeth was her brother-in-law this may suggest that the couple had no children, although this is pure supposition. For the census of 1881 the family were recorded at 9 Cathcart Street in Ayr, with Alexander recorded as a "Printer & Stationer". Also included in the household are : - Janet Ferguson, nee Walker, Alexander's mother; Agnes B Gray, daughter of Alexander's sister Jane and her husband John Gray, born 12 March 1856; Jessie Wilson, daughter of Alexander's sister Janet and her husband Charles Wilson born 14 March 1872; Isabella Burns, Sarah's sister born on 6 November 1832; Elizabeth B(ell) Burns, Sarah's sister born on 15 June 1834. 1881 Census (4th April) Ayr (578) Book 9. Page 10. I believe Sarah died on 12 April 1895, aged 53, at 5 Montgomerie Terrace, Ayr, Ayrshire. Alexander died 0n 3 March 1904 at the same address. Margaret Andrew Burns born 1875, Ayr, Ayrshire. Recorded in the 1911 census with her mother in the family home, aged 35 and single. Margaret Andrew Burns died aged 56 on 13 February 1931, at Glenageary, Dublin, Ireland where she was possibly resident at the time with her mother Grace, her sister Helen and Helen's husband James McCririck, who lived in this locality during this period. (see Helen Grace Burns below). Her usual address would seem to have been 34 Miller Road, Ayr. William Burns born 17 June 1907, Somersby, Dongola Road, Ayr, Ayrshire. Recorded in the household of his grandmother Grace Burns for the 1911 census. Andrew B. Burns born 24 February 1920, Kings Norton, Warwickshire. Andrew Bell Burns died on 18 January 1939 at the Queen's Hospital Bath Row, Birmingham. His death was noted in The Chemist and Druggist viz. "Mr. Andrew Bell Burns, M.P.S., 25 Yardley Wood Road, Birmingham, who died on January 18, left estate of the gross value of £1,476, with net personalty £596." Robert Smith Burns - Appears as informant on his fathers death certificate. Robert Smith Burns Jnr was born on 9 January 1921 at 14 Belmont Avenue, Ayr, Ayrshire. Robert's death was registered in the July-September quarter of 1999 in the registration district of West Surrey. Robert Smith Burns died on 15 February 1945 at the Ayr Club, Academy Street, Ayr of Heart Failure (Sudden Death). He was recorded on the death certificate as a Shipping Agent, aged 64, married to Annie Isbister Muir, the son of William Burns, a chemist and druggist, and Grace Burns, maiden name Smith, both identified as deceased. His normal address was given as 16 Belmont Avenue, Ayr, the the informant was his son, resident at the same address. Annie Burns, nee Muir, died aged 91 on 19 June 1975 at Ballochmyle Hospital, although her uual address was 16 Belmont Avenue, Ayr. Grace - I believe this daughter is Grace Helen McCririck, whose birth was registered in 1918 in Ayr. I believe this Grace Helen McCririck latterly married Robert Houston in 1948 with the marriage recorded in Blythswood, Glasgow. Anne - I believe this daughter is Anne W. McCririck whose birth was registered in the July-September quarter of 1923 in Oswestry with the mothers name identified as Burns. I believe this Anne W. McCririck married John Wellington in 1947 with the marriage recorded in the July-September quarter of 1947 in Wellington, Devon. Helen and her husband lived in Ireland for some time during the 1930's but that James died on 18 September 1943 at Worth Farm Hele Bradninch, Devon, although identified as "of Culm Vale Stoke Canon, near Exeter. in Devon in 1943. There is an entry in the Weekly Irish Times of 2 October of 1943 viz. "McCRIRICK September 18. James William McCririck - beloved husband of Helen Grace Burns, Stoke Canon, Devon, late of Glenageary, Dublin.". This is matched with an entry in the BMD index for Tiverton in the July-September quarter of 1943 for the death of a James W. McCririck aged 60. Helen seems to have returned to Scotland as she died at Faleen, Kockendale, Symington, Ayrshire on 9 May 1972, aged 87. Isabella Burns born about 1886, Ayr, Ayrshire. Recorded in her mother's household for the 1911 census. Nothing more currently known. For the census of 1881 William and Grace were living at 11 Barns Street, Ayr with their three children and a servant. 1881 Census (4th April) Ayr (578) Book 6. Page 26. 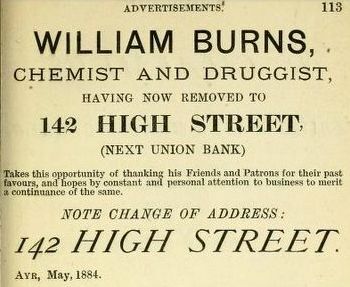 In 1884 William was advertising in the Ayr Trade Directory of that year, informing the public of his move of premises to 142 High Street, Ayr. William Burns died aged 55 on 26 August 1900 at Garden Park, Miller Road, Ayr. He was identified on the certificate as a chemist, married to Grace Smith, the son of Andrew Burns, a clothier, and Janet Burns, maiden surname Bell, both identified as deceased. The informant was his son Andrew. The following year for the census of 1901 his widow Grace was living at 34 Miller Road, (Garden Park?). Also in the household were her children Margaret, Robert, Helen and Isabella. 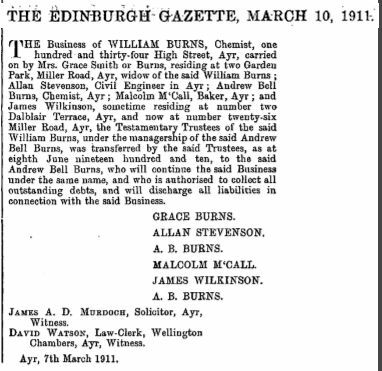 The Edinburgh Gazette of 10 March 1911 has an entry recording the transfer of the chemists business which, it would seem, was being run by the widowed Grace, to her son Andrew Bell. Grace Burns, nee Smith died aged 83, on 28 January 1933 in Rathdown, Glenageary, Dublin, Ireland it is assumed at the house of her daughter Helen Grace Burns and her husband James William McCririck, who were living in the area at the time. (An area in the suburbs of Dún Laoghaire–Rathdown, Ireland. )(see Helen Grace Burns above). Her usual address would seem to have been 34 Miller Road, Ayr.